The dislocation between US equities and Brent crude (discussed here) is by no means unique. A very similar picture is developing between S&P500 and copper. And as with oil, one can blame it on supply fundamentals, but the reality has more to do with a sharp deterioration in global demand as world economies slow. Miller Tabak : - Traders often refer to the red metal as Dr. Copper because it is the only one that has a PhD in economics, and tends to be a great leading indicator of economic conditions. If you follow that thesis, and go by recent trends, Copper could be telling an ugly story for equities. Copper first bottomed in December 2008, while the S&P waited until March 2009. In 2010, Copper made its low for the year in June, vs. July for the S&P. 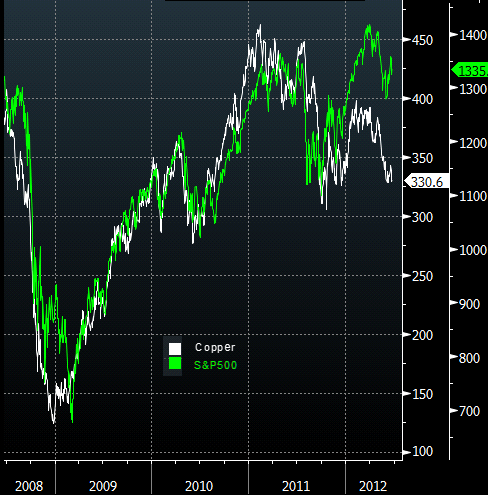 The 2011 peak in Copper was February, vs. May for the S&P. 2012 is almost identical to last year, with Copper again topping out in Feb., while the S&P made its high in March. There are no guarantees that Copper will make a new low for the year, and even if it does that equities will follow, but it certainly bears watching given the historical significance of the relationship.